In the early 1940s, during World War II, many young men, mostly ministers, and evangelists were holding large rallies in Canada, England, and the United States. 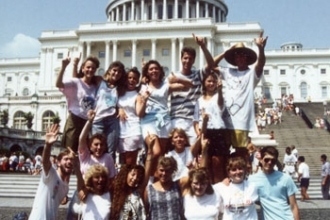 YFC quickly organized into a national movement. 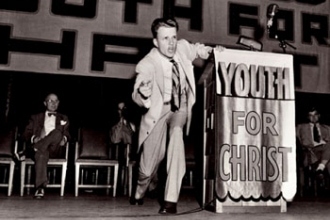 Billy Graham became YFC's first full-time staff member. 1962, YFC changed its organizational structure to become a chartered program of Youth for Christ International. Musical & preaching “Teen Teams” were very important to the development of this International movement. As a part of the YFC/USA’s commitment to serving the world, Project Serve was developed to provide overseas mission opportunities. YFC staff members from the U.S. have ministry assignments with YFC programs in other nations as part of YFC/USA's World Outreach Division. Through a partnership with Young Life, YFC operates Military Ministry to reach out to American teens on military bases both international and domestic. Since the 90s, YFC’s continues to develop effective relational ministry with different types of unchurched youth. ParentLife mentors and equips young mothers and fathers with parenting skills as well as the love of Jesus Christ. City Life reaches out to the millions of young people in our major urban communities, partnering with the church and other organizations. YFC CORE helps school-based adults lead teams of Christian students to reach out to their lost friends. DeafTeen Quest ministers to the unique needs of hearing-impaired teens. And the theme of the YFC Camp program is “Where Everything Changes,’ intentionally targeting lost teens through the proclamation and the demonstration of the gospel message in an outdoor experience. on the YFC alumni website. 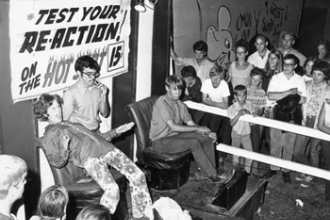 Throughout YFC's history, there has been an unwavering commitment to youth evangelism and biblical Christianity. One of YFC's slogans over the past fifty years has been "Anchored to the Rock, Geared to the Times.” YFC strives to both demonstrate and communicate this message of hope, grace and love in a variety of different cultural settings, and always pursuing teens in personal relationships. Your prayers and financial support continue to help change the lives of young people… one at a time. We refer to this pursuit as a 3Story lifestyle and offer resources and training opportunities to take a “deeper dive” in this way of life.